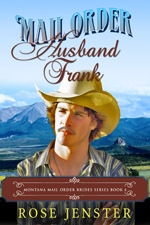 Mail Order Husband Frank can be read by itself, but also is book 4 in the series. He is an intelligent, but somewhat blunt person in his speech! He runs the local newspaper in town and we see him dealing with problems of printing quite often! If anyone saw the movie, “Office Space”, you can appreciate this (though obviously this was before that technology)! Charlotte has a secret identity in Albany and was a student of Leah’s (from Book One). Don’t worry, if you haven’t read book one, it isn’t necessary to do that to enjoy this book. Leah herself wrote to a man in Albany hoping to leave her life in Albany, NY behind her. Charlotte identified with her and also respected her as a teacher. Please feel free to write me or leave comments if you’ve read the book, Mail Order Husband Frank . You can read the reviews as well as preview the book at Amazon by clicking the “look inside” feature. If you want to join the mailing list to get updates on new releases, free stories and extra tidbits, just sign up below. I’ll let you know when book 5 comes out. I am hoping to get it out by Christmas and am working on it now! Frank is a doll! But I love grumpy types of guys that are soft inside. That is like my husband. I love the story of Charlotte and Frank. Will there be a new book soon by you? I loved how there were some people from previous books in here but you didn’t give away the plots- I am eager now to read Felicity. Merry, Merry Christmas. I’m glad you like Frank and the way his life with Charlotte develops. If he is like your husband, you are both very lucky! Oh there is a new book I am editing and I think it will be out in next 10 days or so. If you didn’t sign up for mailing list please do as I will announce it there the day it is released. Have a wonderful Christmas too.